The value of a Expo 67 - 5 cents 1967 stamp depends on several factors such as quality and wear, supply and demand, rarity, finish and more. Values in the section are based on the market, trends, auctions and recognized books, publications and catalogs. This section also includes information on errors and varieties and characteristics. The World's third and North America's initial Universal and International Exhibition of the First Category is saluted by this Canada Post Office Commemorative Stamp. Canada's stamp has as the basis of this design a view of the Canadian Government Pavilion which was built at a cost of $21,000,000. The pavilion was covering 11¼ acres, it is dominated by an inverted pyramid named Katimavik, an Eskimo word meaning a meeting place. At the upper left corner of the new stamp is a reproduction of the 1967 World Exhibition official symbol inspired by one of the oldest drawings of man. 8 groups of two of these drawings for a circle to emphasize the world-wide brotherhood and friendship of mankind. Designed by Julien H�bert, a Montreal industrial artist, the symbol was officially adopted on the 12th August 1963. Canada's aspirations to stage a major exhibition in Montreal were rewarded late in 1962 when the International Exhibitions Bureau granted permission for the event to coincide with the nation's Centennial year. Necessary legislation to permit governmental participation was passed by the House of Commons and on the September 6, 1963, an announcement from the Prime Minister's office appointed the Honourable Pierre Dupuy as Commissioner General of the Canadian Corporation of the 1967 World Exhibition. Expo's one 1,000 acre site is a dramatically enlarged St. Helen's Island, man-made �le de Notre-Dame and adjoining MacKay Pier (Cit� du Havre). Situated mid-stream in the historic St. Lawrence River, it was minutes from downtown Montreal. Based on a design developed by the Canadian Bank Note Company Limited, Ottawa, this stamp was produced in colours of red and blue on white. It was be available in Montreal from April 28 to mid-October, 1967, and from all Post Offices in Canada for the first 10 days after issuance. 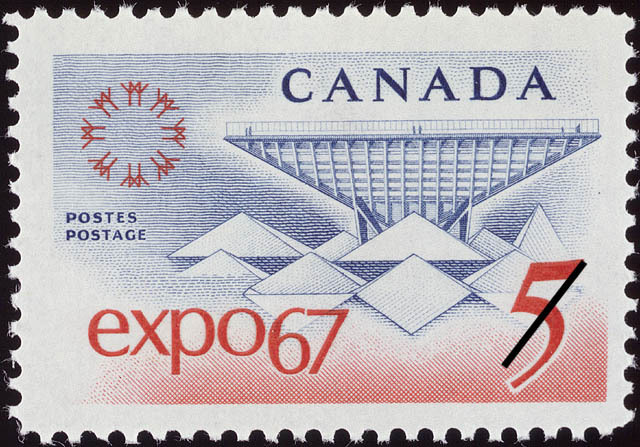 A significant change on this occasion is that First Day Covers were processed by the Canada Post Office from the Expo 67 site with an appropriate die to indicate the source. First Day Covers were not provided with the customary Ottawa postmark.